Designer Burt Rutan, billionaire Paul Allen, rocketman Elon Musk and former NASA boss Mike Griffin are teaming to develop an air-launch rocket system that would use a super aircraft the size of two 747s to carry a liquid-fueled SpaceX booster to 30,000 feet where it would be dropped to fire hardware and humans into orbit. It is called Stratolaunch, a project being financed by Paul Allen, a co-founder of Microsoft, who wants to spur low-cost, private access to space. Allen was a partner with Rutan, pumping more than $20 million in the SpaceShipOne project that captured the X Prize in 2004 as the first private spacecraft to make trips to the edge of space and back. But those were sub-orbital treks. Now, the duo wants to tackle orbital spaceflight to loft manned capsules and even satellites. "I have long dreamed about taking the next big step in private spaceflight after the success of SpaceShipOne -- to offer a flexible, orbital space delivery system," Allen said in a press release. "We are at the dawn of radical change in the space launch industry. 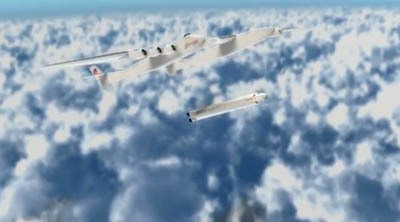 Stratolaunch Systems is pioneering an innovative solution that will revolutionize space travel." Their concept calls for creating a carrier jet with a 385-foot wingspan and six engines to ferry a liquid-fueled, 120-foot-long rocket built by SpaceX and outfitted with five main engines to altitude where the winged booster will be released for launch into orbit. 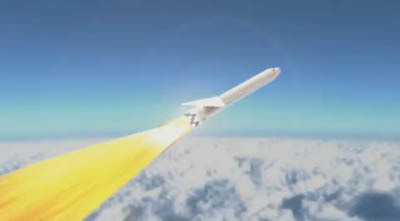 Officials tout the air-launch nature of the system as giving the flexibility to send the rocket on any trajectory to reach any desired orbit, hauling the rocket over the open ocean to aim in all directions, which is something not possible from ground-based pads that are restricted from sending boosters flying over populated areas. 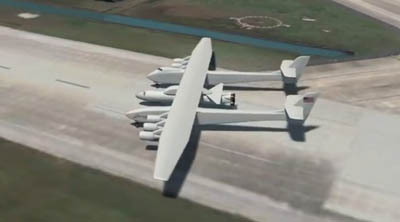 The combined vehicle will weigh some 1.2 million pounds at takeoff. Potential departure points include the space shuttle runway at Kennedy Space Center, Florida, and the carrier will be capable of flying up to 1,300 nautical miles to the payload's launch point. Flight testing of the aircraft is expected to begin in 2015 or 2016, with the first launch sometime later. "Paul and I pioneered private space travel with SpaceShipOne, which led to Virgin Galactic's commercial suborbital SpaceShipTwo Program. Now, we will have the opportunity to extend that capability to orbit and beyond. Paul has proven himself a visionary with the will, commitment and courage to continue pushing the boundaries of space technology. We are well aware of the challenges ahead, but we have put together an incredible research team that will draw inspiration from Paul's vision." Officials say it is too soon to predict the number of launches per year "but the objective is to have a routine mission schedule that takes full advantage of the operational responsiveness and flexibility of this system, and offers a very cost-competitive launcher to the market," according to the company. The Stratolaunch Systems CEO and president is Gary Wentz, a former engineer at NASA. Former NASA Administrator Mike Griffin is a company board member. "We believe this technology has the potential to someday make spaceflight routine by removing many of the constraints associated with ground launched rockets," Griffin said. "Our system will also provide the flexibility to launch from a large variety of locations." The carrier aircraft will require a runway 12,000 feet long, officials say. The plane will be built inside a soon-to-be-constructed 200,000-square-foot facility at the Mojave Air and Space Port in California, site of the SpaceShipOne flights. Scaled Composites, originally founded by Rutan, built SpaceShipOne and its White Knight carrier plane and is now a subsidiary of Northrop Grumman, will produce the aircraft for Stratolaunch. "Scaled is all about achieving milestones and pursuing breakthroughs, and this project offers both -- building the largest airplane in the world, and achieving the manufacturing breakthroughs that will enable Scaled to accomplish it. We are thrilled to be a part of this development program," said Scaled Composites President Doug Shane. "We anticipate significant hiring of engineering, manufacturing, and support staff in the near and medium term." The space booster for the project will be manufactured by Space Exploration Technologies, better known as SpaceX. The Elon Musk-founded firm has developed its Falcon rockets and Dragon capsules in-house from scratch, and now becomes a supplier to the Stratolaunch concept. "Paul Allen and Burt Rutan helped generate enormous interest in space with White Knight and SpaceShipOne," said Gwynne Shotwell SpaceX president and Stratolaunch board member. "There was no way we weren't going to be involved in their next great endeavor. We are very excited." The advertised cargo-carrying capacity for the rocket is 13,500 pounds of payload to low-Earth orbit, putting it in the same general class as the Delta 2 rocket. Stratolaunch's corporate headquarters is located in Huntsville, Alabama. The systems engineering and integration tasks on the project will be handled by Dynetics, also of Huntsville. Former space shuttle launch director and current Dynetics executive vice president David King will be another of Stratolaunch's board members. "We are excited to play such a major role on this system. This is an ambitious project unlike any that has been undertaken and I am confident the Stratolaunch team has the experience and capabilities to accomplish the mission," said King. Over 100 people are working on Stratolaunch today and the company says there will be "a significant ramp-up" in employment in Alabama, California and Florida as the project moves into manufacturing and eventually operations. "It has become evident that the industry needs a responsive and operationally flexible solution to increase flight rate resulting in lower cost missions. This non-traditional approach to launch could open up the market for truly privatizing human spaceflight," the company's statement says.